How do you peel a banana? Or leading young people from food poverty to food (and language) riches. With help from Jack Monroe, Rodrigo y Gabriela and the smelliest fruit in the world! Staff in another nursery had set up a ‘smell experience’, where they had put a selection of little pots containing fruit juice, herbs and spices, for the children to smell and talk about. One little Bangladeshi girl was taking a while to settle into nursery. She was beginning to really enjoy playing in the sand, doing puzzles and playing with dough, but whenever she moved from one activity to another she remembered that she was without her mum and would burst into tears. She was in the early stages of learning English and was a bit wary of me. Once I had tried all my Bengali phrases on her (water, fish, sit down and a few other random words) she began to relax, so we went over to join in with the smell experience. She was having a few gentle laughs at me pretending to feel sick at all the smells in the pots, which she thought were all lovely. Then we came to the pot of curry spices. She took one sniff, smiled a very big smile and exclaimed, ‘Didi, Dada, Ama, Aba!’ (Granny, Grandad, Mummy, Daddy!) Food is love. Then we have a go at opening our bananas ‘the wrong way’. As you can imagine, this causes uproar. My point is that food, love, experience and language are inextricably mixed. When I was leading the Every Child a Talker (ECaT) project, we were looking to boost the language of children with limited vocabulary. The children didn’t have language delay caused by problems such as glue ear or developmental issues. Their big problem was a real paucity of vocabulary. This came from lack of experience. A little boy approached me once in a day nursery. He had a banana in his hand. He asked me, in a very cheeky chappie kind of way, ‘’Ere Mate. Open that for me, will ya?’ I was tempted to respond, “Yes, I’d love to peel your banana’: thus increasing his vocabulary by two words. However he was shocked, nay flabbergasted, by what I did next. 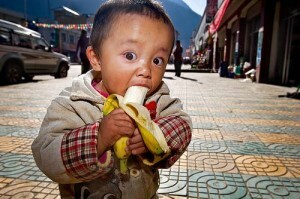 I peeled his banana the wrong way. Well I had completely misjudged the little fellow’s language skills. Based on his response, I learned that he had indeed got a very rich vocabulary… made up mainly of words consisting of four letters. Children, like adults (and especially French adults) love to talk about food, and particularly what they don’t like. Preparing and cooking food stimulates a huge amount of interest and talk. But how can you talk about food if your diet is limited mainly to precooked meals? I’m not being snobby about how other people eat: I just know that if there are two children starting school and one calls a tangerine ‘a little orange’, while the other one says, ‘Is that a tangerine or a clementine?’ I can predict fairly accurately which one will do well in school. It’s all about experience. The ‘little orange’ boy will almost certainly not have experienced peeling and eating a tangerine. It’s as simple as that. A dietician who worked with us on an ECaT project explained that fruit in the UK is a real luxury. If you are a parent on a low income, you have to make very serious choices. Do you buy a bag of chicken nuggets or a bag of oranges? Not only will the nuggets be cheaper, but you can guarantee that the children will wolf them down, whereas they may not eat the oranges. Likewise if you are a very young mother, would you buy a bag of apples or a box of value washing powder? Chances are you would go for the washing powder. When you are a very young parent you tend to think that everybody is going to judge you as you walk down the street, so your child’s clothes are always going to be spotless. It was a real eye-opener for me to hear that, I can tell you. 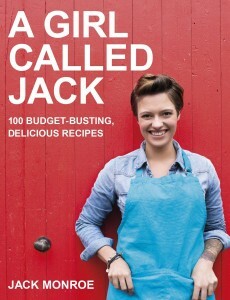 Enter Jack Monroe. Jack is on a one-woman mission to help people on a low income improve their diet, despite having a very limited budget. She is a total inspiration. My hope is that as children are introduced to a wider variety of foods at home, they will have more to talk about, thus improving their chances of success in school. Here’s a way that I make the link between experiencing food and increasing our vocabulary. Have you ever heard of the fruit in the photo below? 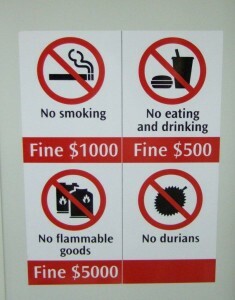 The durian (pronounced doorian) is so fearsome-smelling that it is banned from public transport in Singapore (including in taxis). In many countries in South East Asia, hotel staff will sling you out if they get even the faintest whiff of durian coming from your luggage. I have mentioned the name of this fruit seven times, and told you all about it. Has the word durian entered your vocabulary yet? If one of your kids walks in from playing in the park and there is a very nasty smell wafting upwards from one of his trainers, might you call out, ‘Either you’ve trodden in dog muck or stepped on a ripe durian’? Maybe not. However, next time you are in Waitrose and you fancy having a laugh, ask one of the young Saturday staff working on the fruit section if he has any durians in stock. After half an hour of him searching and asking all his colleagues, just pray that the manager doesn’t find one for you and make you feel so guilty that you end up buying it. Then your children will know what you are talking about. Food is love. Food is medicine. Food is life. Food can smell like hell. 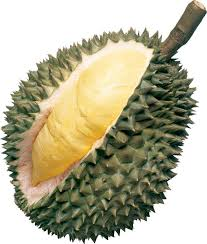 The durian: the original Forbidden Fruit? Braniac Durian smell test: prepare to be disgusted! It made all twums on me twaaziz – I had to say it out loud to get it! Fantastic! You have given me an idea…. I agree about the Jack Monroe clip. It makes me feel like I have just had a bowl of Thai noodle soup with too much chilli sauce in it! I think there is a lot of mileage in setting up cooking workshops for parents, and particularly those on a low income, who may be ‘vulnerable’ in all sorts of ways. They could have a big impact on language development. Guess who I think would be just the right person to do this? I have read several articles about Jack, and in one she mentions that lentils are very cheap and nutritious, but we have to realise that not everyone likes lentils (including me!) I think the concept of taking ‘value range’ food and creating meals that little children would love to eat is just brilliant. BTW Waitrose have brought out a ‘basics’ range. I don’t know what the price range is, but I know that you can go there 20 minutes before closing time and get amazing bread that normally retails for £1.99 for 20p. I used to live near Waitrose in North Finchley and used to buy loads of it and freeze it! Thank you for responding and feel free to email my post to anyone you know who has little children or works with families.